Opinion: Where Exactly Does Bermuda Stand? Where, exactly, does Bermuda stand? What needs to happen between now and July 2020? Lots of numbers get tossed around, but, as with any arithmetic problem, there is really only one answer. Here, exactly, is where Bermuda’s public debt stands, on this day, as you read this. The current total for all Notes and Bonds is $2,185,000,000 [that’s $2.185 billion]. 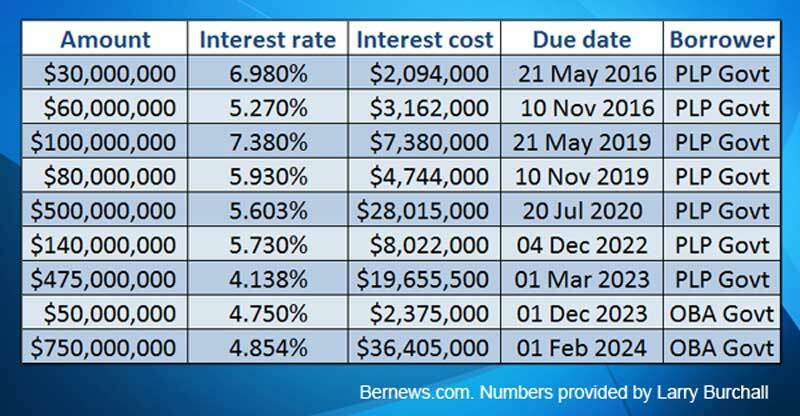 The current average annual interest rate on this $2.185bn is 5.12%. The total annual interest cost is $111,852,500. The ‘due date’ is the date on which the lender expects to be repaid the full amount of the loan. Of the current outstanding Debt, the previous PLP Government borrowed $1,385,000,000 [$1.385 billion]. This was borrowed over the six years between 2007 and 2012. Of the current outstanding Debt, the current OBA Government borrowed $800,000,000 [$0.8 billion]. All of this was borrowed in 2013. Only $50,000,000 is owed to local lenders. This $50m total and its annual interest is repaid and paid in Bermuda dollars. The annual interest cost for this $50m loan is $2,375,000 [Bd$]. The remaining $2,135,000,000 is owed to foreign lenders. The loan and the interest must be repaid and paid in US dollars. The annual US$ interest cost is $109,477,500 [US$]. The Government Loans Act mandates that Government must annually set aside 2.5% [one fortieth] of the value of the public debt outstanding at the end of each preceding year. This applies to the $2,185,000,000 that is currently owed. One fortieth [2.5%] of $2,185,000,000 is $54,625,000. In 2015, the Government must set aside $54.625 million. This is paid into the Government Borrowing Sinking Fund so as to build up funds intended to repay the outstanding public debt. Adding the annual Sinking Fund contribution [$54.625m] to the annual interest payments [$111.8525m] gives an annual non-negotiable Debt Service Cost of $166,477,800. This annual Non-Negotiable Cost [NNC] is what I call Nanci. Nanci is a non-negotiable cost because Bermuda law sets the Sinking Fund contribution and the loan contracts with the overseas and local lenders set the interest rates. In 2015, and particularly since 2010, Sinking Fund contributions are and have been, too small. The legislated 2.5% rate was set thirty-seven years ago, in 1978, in a time when no one – no one at all – envisaged that Bermuda’s public debt would ever get as high as now – currently over twice Government’s annual revenue [2014/15 Revenue $902m/Debt $2,185m]. In 2015 and going forward, a more realistic annual Sinking Fund contribution would be at least 4.5%. This would require that the Government-of-the-day set aside 4.5% of $2.185 billion. 4.5% of $2,185,000,000 is $98,325,000 [$98.325 million]. Clearly, with this and the next Government administration struggling to find the current $166 million for Nanci, achieving $210.2 million would be impossible. So from 2020, Bermuda is stuck with Debt rollover, which means, consequently, seeing Nanci rise anyhow! It’s that classic – centuries old – Debt Trap! When, finally, Government starts paying for the new KEMH wing, Nanci will grow even larger by this new and additional Non-Negotiable Cost. This KEMH addition to Nanci is currently expected to be around $30 million a year. That will grow Nanci to $196 million a year [$166 million now + $30 million for KEMH]. As the America’s Cup activity and some of the projected construction projects start up and continue, Gross Domestic Product [GDP] should begin inching up and Bermuda’s six year recession should technically subside. Between now and 2017, driven by the America’s Cup and new construction works, I expect and predict that GDP will rise; that unemployment amongst Bermudians will fall; and that there should be a small increase in overall Government revenue. In Bernews [9th December 2014] I explained why, despite the revenue rise and economic improvement, these America’s Cup and construction projects still will not lift Bermuda’s GDP high enough to resolve Government’s self-inflicted Debt Trap problem. Even with all 28,000 potentially available Bermudians employed, Bermuda’s national workforce still won’t get past 38,000. However, going into 2020, economic success requires that Bermuda’s national workforce grows beyond 38,000. Bermuda’s national workforce needs to go past, way past, 40,213 and the $6.11bn GDP level of 2008. Despite even a major 15% rise in GDP between now and 2017, the underlying arithmetic that I’ve described does not change. On current trajectory, by 2017, Bermuda’s GDP will not rise beyond the minimum $7.5bn ceiling that is needed for break-even [See Bernews: 18th December 2014]. What Size Economy Does Bermuda Need? What Bermuda needs is a national workforce that goes well past 40,213 persons filling jobs in Bermuda; and an annual net year-on-year GDP rise around 8% that will push GDP to $8.0bn – and do so before 2020. The unchanging underlying and absolute arithmetic is that Bermuda’s economy must become big enough to afford Nanci without continued Government borrowing or severe Government cost-cutting. That requires GDP at $8.0bn or higher. For Bermuda, a big enough economy is an economy with a GDP of at least $8.0 billion. This level of GDP will require a national workforce far greater than 38,000 people filling jobs in Bermuda. i hope a copy of this opinion was delivered to the Department of Immigration and the BIU to faciliatate their understanding why Bermuda needs LESS bureacracy with granting work permits for MORE foreign workers in order for this country to emerge from under the Debt Trap. that we have accumulated. — at this stage who care’s who was at fault it has to be paid- one way or the other. There are great ideas that have been put forward but were to slow, and to conservative to act on them. sentencing except for Major Crimes, hosting international Business and Sports events, a Casino – how about approaching Foxwoods or Mohegan Sun Casino’s to get them to invest in building a Cassino here- or buying up several profitable Business in the USA – just Idea’s. Well so far only a few Ideas have come to life in order to make money — AC35 is due to make $300 Million Dollars — we need more than that. I’m sure there’s a million excuses why we won’t and can’t do any ideas I’ve sugested. If you buy a profitable business, you will likely pay above market value , unless business owners need liquidity. That Market Value will have future returns baked into its price. If using a div valuation model the future growth and div form the basis of its price. Who then runs this business? To expand it and make it more efficient to realize greater returns? What does govt know about running an amusement park ? that would have to be foreign investment and management expertise. The OBA is doing all it, whilst still protecting Bermudians to encourage foreign investment on our shores. The basic facts of the article are correct but the proposed solution is superficial at best. Bermuda will not be able to repay the existing debt by simply increasing the size of the population. In the fisrt instance, significant social instability and inflation accompanies increased population. Another step is to recognize that jobs in Bermuda have to allow Bermudians to reach their maximum potential without arbitrary limitations. Failure to do so will further exascerbate the ‘anti foreigner sentiment’. The PLP sold generations into financial slavery. Cox and Brown ruined the country. As serious a situation Bermuda finds herself in, I always enjoy reading Larry Burchall’s pieces. They are so well organized and explained and based in reality and fact. They don’t contain so much as a hint of hot air or smoke-blowing or noise (here’s looking at you, Mr. Famous). I have to take a great leap of faith to believe that we (all who inhabit this beautiful island) will get it together and see di forest shru di trees, but I still believe. Though it’s sad knowing that it would be an uphill battle for someone like Mr. Burchall to succeed in local politics. Too real and un-emotional. Too country-above-party. Too honest. I’d have to agree ! We all dysect the messenger and not enough of the message! At least Mr Burchall comes with figures to go with some type of solution to prove his point !!! Rather than tell you drink the koolaid, force something in you and then say you’re used to it the other team did it too !! Trust me drink the koolaid and it will soon turn to swizzle !! Thanks for the informative information Captn B ! Thank you Larry!!! Now all we need is, all the plp xenophobes to read this over and over until it finally sinks in??? We are all truly doomed if we can’t pay our obligations, and the time for that is coming real soon!!! All Bermudians can thank the plp for this mess we find ourselves in today!!!!! @kaangocar !! Name calling and being derogatory is foolish enough !! Are you smarter than a fifth grader ? Do you truly love thy neighbor? Where’s your turff ? Are you a silent gangster ? Smh ! One thing that’s missing from the debt picture – the funding shortfalls for the various government pension plans. That’s money that the government will have to come up with sooner or later. I am no economist or accountant but I still want to know where all of that money went. I want those responsible brought to justice & I want every penny that is recoverable back. I it is almost beyond belief that what was once the jewel of the Atlantic has become a near worthless trinket in such a short period of time. Even more beyond belief is the number of people who do not understand what has been done to them & don’t thnk that anyone should be held accountable. That is exactly why I totally support our Governor with his decision to keep Mr Fields on at the DPP, it is my hope he is looking into the unaccounted for $800 million and is close to pressing charges!!! We need to just focus and stand up for ourselves and our island home. Ok…Russia had a big debt to international bankers and paid it off. As a result they are not under the thumbs of said “persons”. Luckily Russia had the benefit of natural resources. If Bermuda pays off this debt how will it prevent the same abuse from usurious bankers who are doing the same to every other country that is tied to central banks, the main bank being the BIS. Even the great U.S. is at the mercy of these international extortionists who have been granted legitimacy through legislators and public indoctrination since 1913. In the U.S., money is supposed to be coined by the govt so as to reduce debt like how Andrew Jackson did in the 19th century. Deviously,legislation put it back in the hands of the international “priesthood”. Have we been so thoroughly seduced by the beast that we can’t break away..How do we curtail these usurious practices..Can we reach out to our brethren in oil rich countries for debt free loans..Can we allow sharia law (read Islamic, debt-free) banking practices to be more common place here..
Bermuda is a cutting edge jurisdiction, supposedly. Maybe we need more cutting edge ideas. It’s a complicated mess. Your suggestion that ‘foreign or outside’ bankers are at fault is seriously off the mark. No ‘foreign lenders’ came or have come to Bermuda’s shores and forced us or inveigled us or deceived us into borrowing even one dollar of the current two billion dollars. Instead, it worked the other way around. Between 1978 and 2013 Bermudian decision-makers went out to find those foreign lenders more than twenty times. Bermudian decision-makers asked. The foreign lenders merely said yes, set an interest rate, and then delivered the funds. In these over twenty transactions, there is no sign of “abuse from usurious bankers”. You’re correct on the need for ‘cutting edge ideas. What are yours? The process for nations or countries who are affiliated with central banks, that produces their ‘money’ is faulty and injurious to those countries. This creating money out of thin air and entering it as electronic entries is something that we do not ponder much as we’re too busy chasing the almighty Thaler. The reason for ‘debt’ is the interest payments compounded over time that even the mighty U.S. will not pay off.. Impossible for them and here we are wringing our hands over a mere 2.2 billion in FRNs. Ha ha Larry must be hanging out with Marc Bean! This is a pipe dream. The country is currently borrowing $260 mil per year just to stay afloat. The economy fell again last year. The Americas Cup will only saddle the country with more cost…that means debt….to prepare for the event which lasts only one…ONE….month! Not a chance in the Amazon basin diversity statistics that we will earn enough revenue from visits by 50k to 70k additional (??) tourists to pay down our debt and eliminate the deficit of $260 mil per annum. San Francsico over estimated tax revenues from hosting the AC by 75%!!! Only the ACOC make money from the AC…..they are like FIFA, Olympics they get other people to pay for their party! People of Bermuda better be ready for a large hangover when we wake up on Jan 1, 2018……cause our heads will hurt…..and Prospect Primary and Victor Scott Primary (both less than a mile apart!) will still only have about 80 kids each and a full compliment of teachers…. and we will only have a huge debt bill to show for it! Does everyone know what FUBAR stands for? If the Govt pays back the debt owed plus interest maybe it should look into securing interest free loans and break away from the tight financial orbit of the usurious debt-based lender until we do not require such loans. We have begun to strengthen links with the Islamic financial world through studying sharia banking so take it further and seek out these lenders instead. So you agree the PLP sold our future to foriegn banks. They aren’t any more culpable than any other govt who have fed from the debt-based usury lending trough.. All govts who’ve done so are just as guilty. As far as most western govts are concerned this is the only and most accepted way of procuring funds..this injurious system is mostly at fault.. a new fairer banking paradigm is needed and IT IS COMING! Whether the FEW like it or not. Its not about the PLP or the OBA or even the Democrats or Republicans. The rabbit hole of culpability goes way deeper and further back in Time than that.